I wanted something more substantial than a normal doorknob or latch for the hardware on this door. After looking at various hardware stores, I found this black vertical pin that was to be used for a garden double wide gate. The handle is one for a standard utility door that matched the pin. 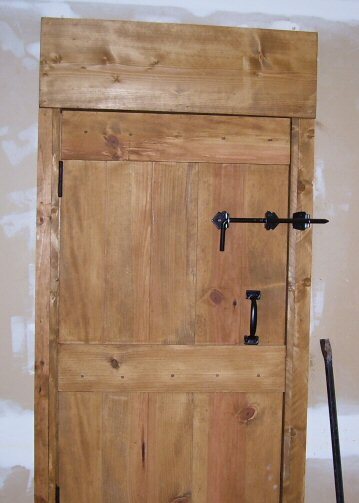 The frame of the door is made of recycled wood from a salvage yard. I used a bridal joint to join the pieces together, then ran a wood screw through the connection for additional strength. The layers on the door are a 1/4″ plywood, the frame, the 1″x6″ boards and then another 1″x6″ board running crosswise across the width of the door. The interior of the door is full of fiberglas insulation and the entire structure is stained a golden oak color. This is the finished ’secret door’. 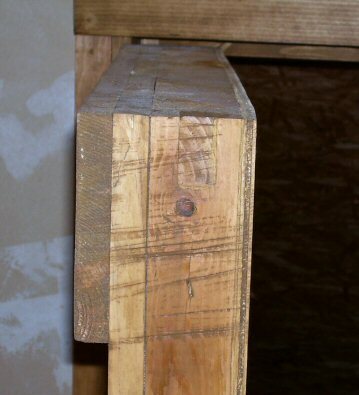 It is made from scratch using lumber from a Habitat for Humanity salvage yard and materials from Lowes. It is 3″ thick and roughly 54″x22″ and is insulated. 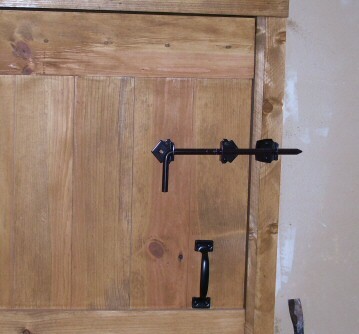 The latch is a garden gate latch and the hinges are decorative black. The door leads into an uninsulated storage area above my garage and will be within a storage closet. The visible surface is made of 1″x6″ boards laid edge to edge and fastened to the frame with screws.